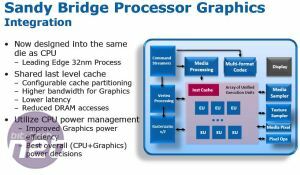 If you're having trouble keeping up with the names of Intel's graphics products, then you're certainly not alone. Two generations ago, the G45 chipset gave us the GMA X4500HD, and then the number was lopped off with the introduction of Clarkdale CPUs, leaving us with just GMA HD. Now we've even lost the 'GMA' portion, while also regaining a lower number to represent Sandy Bridge graphics. Please welcome Intel's HD Graphics 3000 (12 EU parts) and HD Graphics 2000 (6 EU parts) to the stage. 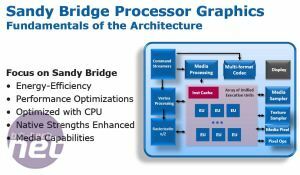 Intel's new graphics design is quite a different beast from its previous efforts. For a start, we now have a single, monolithic chip design with the graphics and CPU portions on the same silicon, as well as a brand new internal ring bus, enabling the graphics core to share a portion of the CPU's ultra low latency L3 cache. It also has far more memory bandwidth, not to mention faster direct CPU access, because we've finally lost the antique front side bus. Even Clarkdale had a limited, fixed front side bus system between the CPU cores and the separate die containing the graphics, memory and PCI-E controllers. Not only that, but the core frequency of Sandy Bridge's graphics system is higher than ever at 850MHz, and you can use TurboBoost to push this up to 1,100MHz on the Core i5-2500K, and 1,350MHz on the Core i7-2600K. DirectX support has also been updated to version 10.1 from 10.0, and there's naturally support for DisplayPort and DVI too, with the latter finally being updated to the dual-link standard. Similarly, HDMI support has been updated to 1.4a as well, which includes support for 120Hz 3D Blu-ray movies on top of all the features from previous HDMI standard, including picture-in-picture, bit-streaming audio and dual audio streams, 24Hz support and the usual ClearVideoHD de-interlacing. The graphics system also enables two digital outputs to be used simultaneously. 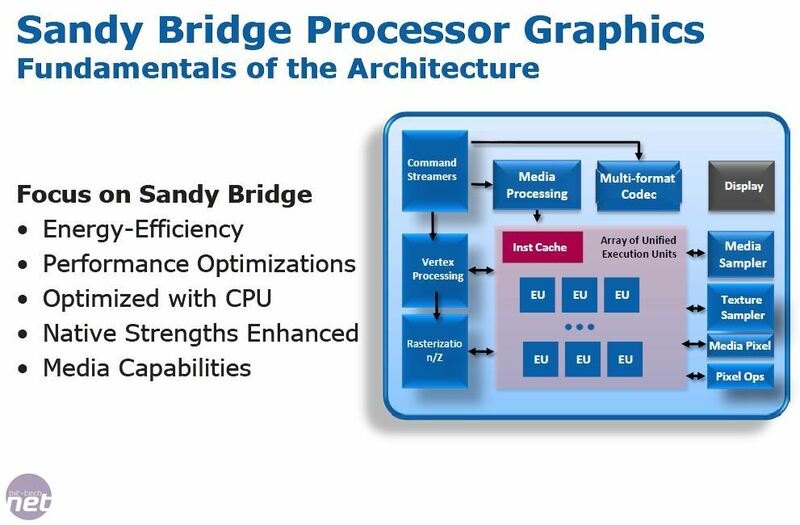 However, as with Intel's GMA HD system, not every Sandy Bridge desktop CPU features the same level of power. 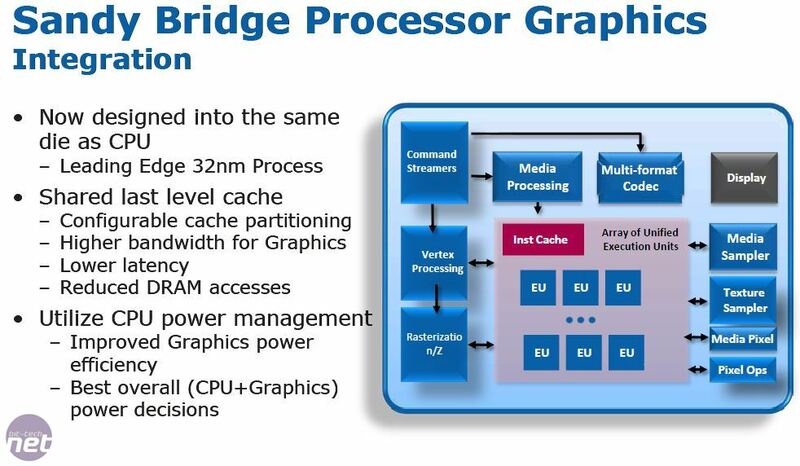 In fact, the Core i5-2500K and i7-2600K are the only desktop CPUs that feature the full count of12 EU graphics cores. It's also worth noting that you can't use the graphics core for video transcoding if you have a discrete graphics card installed either, as there's no way of switching between graphics systems. Conversely, all the new mobile Sandy Bridge parts pack in the full count of 12 EUs, which means that all future Sandy Bridge laptops will get a healthy dose of graphics performance. Finally, it's worth mentioning which motherboard chipsets support the new technology, which include the H67 H61 and the future Z67 PCH chips, although the budget-end H61 won't allow you to overclock the graphics processor. Current H67 boards on the market feature options for increasing the clock speed of the System Agent die-area that houses the processor's graphics system, as well as enabling you to tweak the voltage applied to it. $50 million deal for future Atom tech. 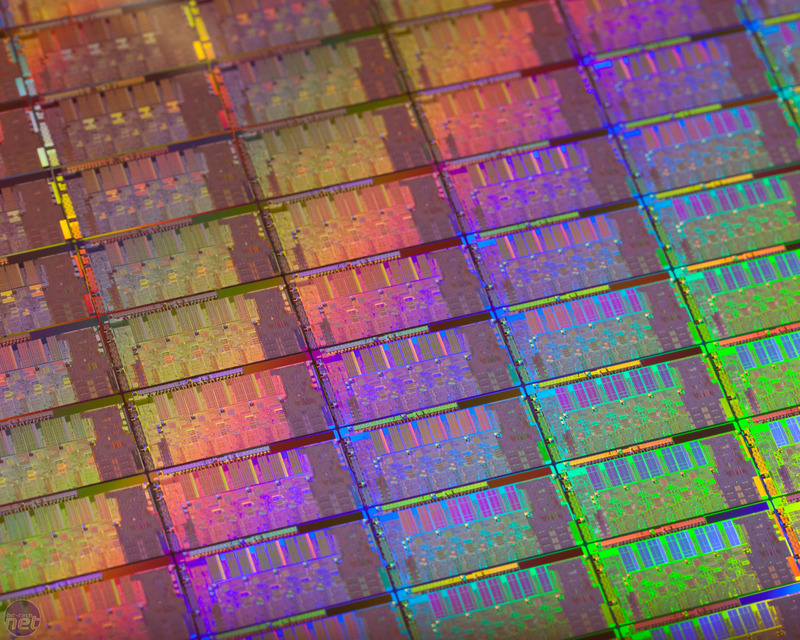 Without doubt the new range of Intel CPUs are incredible - we show you why. How many CPU cores does StarCraft 2 use? We investigate how the latest hit RTS, StarCraft 2, scales across CPU cores.